Colorado Springs, Colorado. 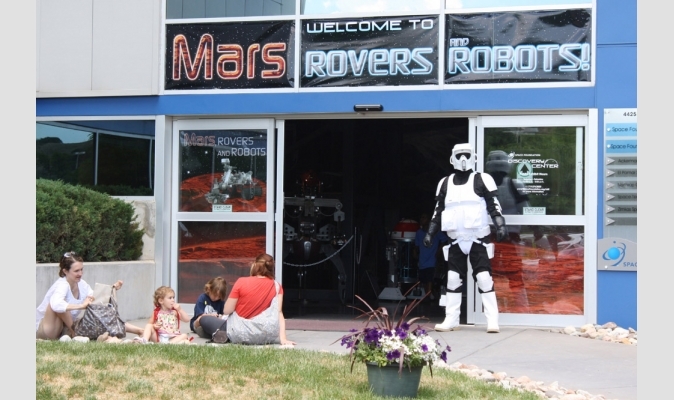 July 7, 2014 — As part of the Summer of Discovery activities at the Space Foundation’s Discovery Center in Colorado Springs, one of last year’s most popular programs will be reprised. Mars, Rovers and Robots will begin on Tuesday, July 8, and will feature a number of fun activities. Try your hand at maneuvering underwater robots, build a Mars habitat, see robotic and hovercraft demonstrations and, on July 12, meet your favorite Stormtrooper. Saturday’s activities on July 12 will also feature a special astronomy-themed SphereCast with ‘Imiloa Astronomy Center of Hawai’i on the Discovery Center’s Science On a Sphere® at 1:00 and 3:00 p.m. Most of the activities are included in the price of daily admission. See the website for a full schedule at www.spacefoundation.org/events/summer-discovery.